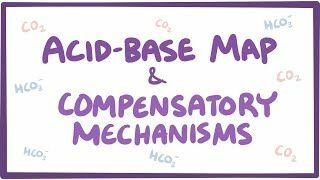 Osmosis: Acid-base map and compensatory mechanisms. (2019, April 20). Retrieved from (https://www.osmosis.org/learn/Acid-base_map_and_compensatory_mechanisms). In renal failure where large amounts of HCO3- is lost, it can lead to metabolic (acidosis/alkalosis) . Every single moment, there are trillions of biochemical reactions going on inside our bodies. These reactions are mediated by enzymes, and for these enzymes to function properly, the pH of our body fluids needs be within a tightly regulated range. This pH depends on the ratio of the concentration of bases, mainly HCO3−, and acids, mainly CO2, and it’s calculated by a lengthy, complicated equation, known as the Henderson-Hasselbalch equation, where pH = 6.1 + log HCO3− concentration / 0.03 partial pressure of CO2. If we focus on the pH of our arterial blood, we can design a diagram, or acid- base map, with the concentration of HCO3− on the x axis, and the partial pressure of CO2, or PCO2, on the y axis. Using the Henderson-Hasselbalch equation, we can plot a line called an isohydric line that starts at the origin. The term isohydric means that along these points, they all share the same or “iso-“ concentration of hydrogenated ions or same pH - “hydric”. For example, let’s say HCO3− concentration is 24 mEq/L and PCO2 is 40 mmHg. According to the Henderson- Hasselbalch equation, this would give us a pH of 7.4. Now, we’ d have the same pH of 7.4 if there was a HCO3− concentration of 36 mEq/L and PCO2 of 60 mmHg, or with a HCO3− concentration of 12 mEq/L and a PCO2 of 20 mmHg. In fact, we can draw out two more isohydric lines - this time for a pH of 7.35, and another for a pH of 7.45. A normal pH is between 7.35 and 7.45, so you can see that there are a lot of combinations of HCO3− concentration and PCO2 that are between these two lines that would result in a normal pH. In fact, because it’s so important for the body to stay between these lines, the body has designed several mechanisms to maintain homeostasis or balance. One mechanism involves the lungs, specifically the rate and depth of breathing which controls the amount of CO2 that’s breathed out. And another mechanism involves the kidneys, which, slowly can carefully control the amount of HCO3− that’s excreted. Now, sometimes these regulatory processes get disturbed. Specifically, if there’s a decrease in the ratio of HCO3− concentration to PCO2, the pH drops below 7.35 and we shift to the upper left part of the acid- base map, where there’s acidosis. On the other hand, when this ratio increases, the pH rises above 7.45 and we move to the lower right part of the acid-base, where there’s alkalosis. Acidosis and alkalosis can be classified according to their root cause as being either respiratory or metabolic. Respiratory pH disorders result from some problem with the respiratory system, and it results in a PCO2 value that’s too low or too high. For example, when breathing is too shallow due to diseases such as pneumonia, CO2 can’t get eliminated efficiently and accumulates in the blood. Thus, PCO2 usually rises and the pH decreases, causing a respiratory acidosis. On our acid- base map, this could be represented by any point within a shaded area of pH values much lower than 7.35 and PCO2 above 45 mmHg. That’s only acute, though, meaning that it goes on for a limited period of time, typically a few days. That’s because the kidneys recognize that the pH has decreased, and try to compensate for the imbalance by retaining more HCO3−, which usually rises above 26 mEq/L. This brings the pH as close to the normal line of 7.35 as possible, but it does take a few days for the kidneys to do this, so it’s considered the chronic phase of the condition. On the flip side, if a person is breathing faster than normal, there’s excessive CO2 loss, so PCO2 decreases and the pH rises. On the map, this shifts us into the area of respiratory alkalosis, where pH is a lot higher than 7.45 and PCO2 has dropped below 35 mmHg. Once again, there’s an acute phase, but over several days, the chronic phase kicks off, and the kidneys begin to excrete more HCO3−, which decreases below 22 mEq/L, and pulls the pH closer to the normal range again.